We are very proud of our school community; we are passionate about being a school built on strong values. We believe our ethos has something very positive to offer every child. We would very much like to have an opportunity to welcome you to our school and take you on a tour. We want you to see first-hand what we do here and how we will provide the very best start for your child. We aim to put children at the centre of their own learning and place great importance on nurturing skills and attitudes such as independence, resourcefulness, resilience and co-operation. We value academic success very highly and provide a rich and stimulating curriculum that challenges and stretches learners. We are rigorous in our approach and have high aspirations for all our children. We aim to provide children with the best possible learning environment and opportunities to enable them to fulfil their potential by developing their strengths and recognising where they need to improve further. Many subjects are taught in a cross-curricular way and we provide opportunities for real and purposeful learning. Some lessons are delivered through a Critical Skills approach where the children work together on practical problems which have been posed as challenges. The Clevedon Learning Trust is a Multi Academy Trust in North Somerset, formed on 1st January 2015. 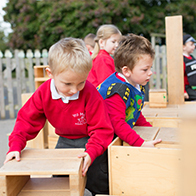 The Trust is made up from school clusters in the Clevedon and Bridgwater localities.